We haven’t heard from Marty in a while, so….drum roll please and heeeeeeeere’s Marty!!! For a first time visit to Scotland that entailed approximately 3 weeks there are quite a few lasting impressions. Most of them are related to images in my mind of vistas; views across rolling hills of cleared fields with herds of cows and sheep idly grazing. A few stone farmhouses beside narrow lanes or rows of stunted trees. 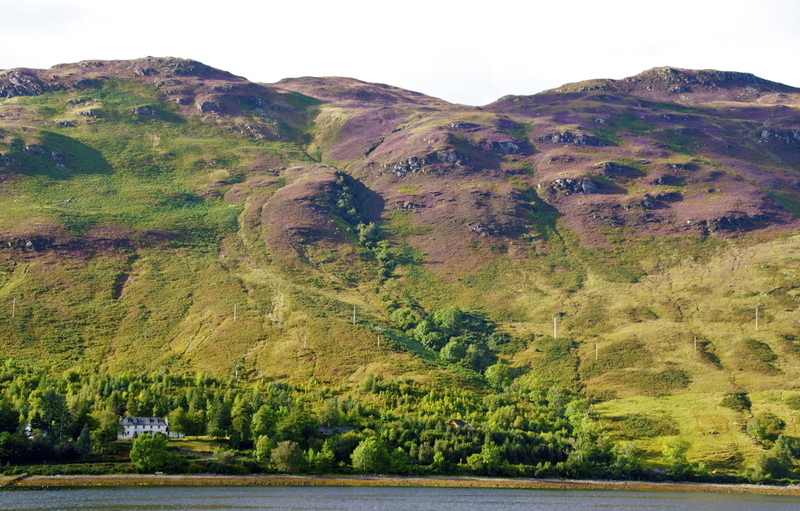 Views of the long and narrow lochs without cabins placed elbow to elbow along its shore. Beautiful blue stretches of sea across to the islands, fields of purple heather climbing up the hillsides, and the castles and abbeys! Some grand, some in disrepair but all full of history. There is also a lasting impression of the people themselves. While we were there it was a lead up time to an important referendum vote concerning whether Scotland should be its own country. A simple yes or no vote was held on September 18th. As of this writing the outcome is not known* but my impression was that it would be very close. The bigger cities like Edinburgh seemed more inclined to vote no and remain part of the UK; however the further away from the cities we travelled the stauncher became the yes vote. Now remember; we are being tourists at battlefields like Culloden and Bannockburn, and loads of castles like Eilean Donan that were involved in the English subjugation of the Scots. A history that has certainly NOT been forgotten by the locals even though it has been 300 to 700 years in the making. The Scots are generally a friendly people and they get friendlier when opportunities to have longer conversations arose and not all conversations were in a pub fueled by the powerful, tongue loosening scotch! Interest runs high on Happy Dance regarding the vote! Speaking of pubs; I was a bit disheartened with the local beers and finally returned to a good solid stout (Guinness, which is actually Irish!) towards the end of the trip. Even worse was that popular beers included Budweiser, Coors Light and… wait for it… it’s worth it… CORONA!!!! As I mentioned to the pub tenders even Mexicans don’t drink Corona! We also tried a few scotches along the way and enjoyed all of them except Laphroiag. That one could be used for antiseptic! We both ended up with a fave and mine was Dalwhinnie while Sue gave Balvinnie her highest score. 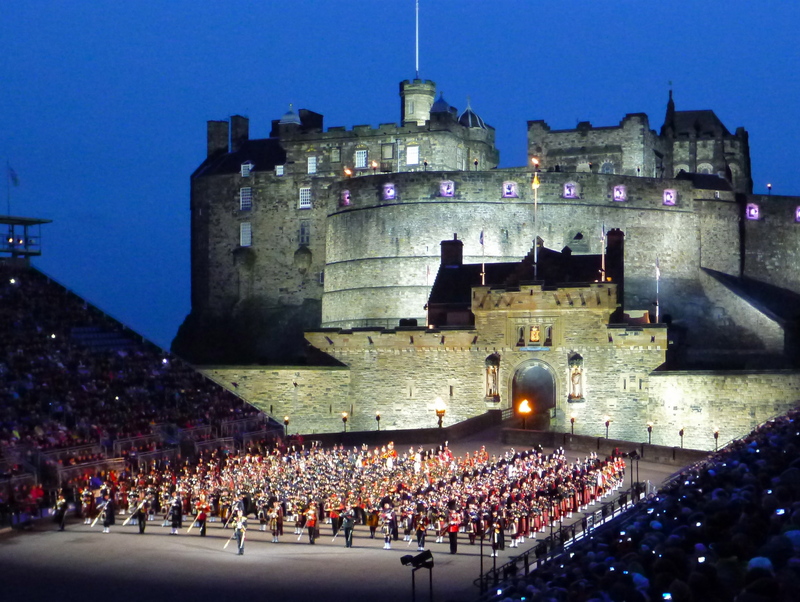 We had planned some events like the Highland Games and the Military Tattoo at Edinburgh Castle before we left. The Highland Games were interesting and we joined in the parade led by the Duke of Argyll to start the Games. The fun part of that was we were at the Duke’s “house” the day before! The Military Tattoo was what started our whole adventure as we purchased tickets for it way back in March. The Tattoo was everything it was hoped to be and more! 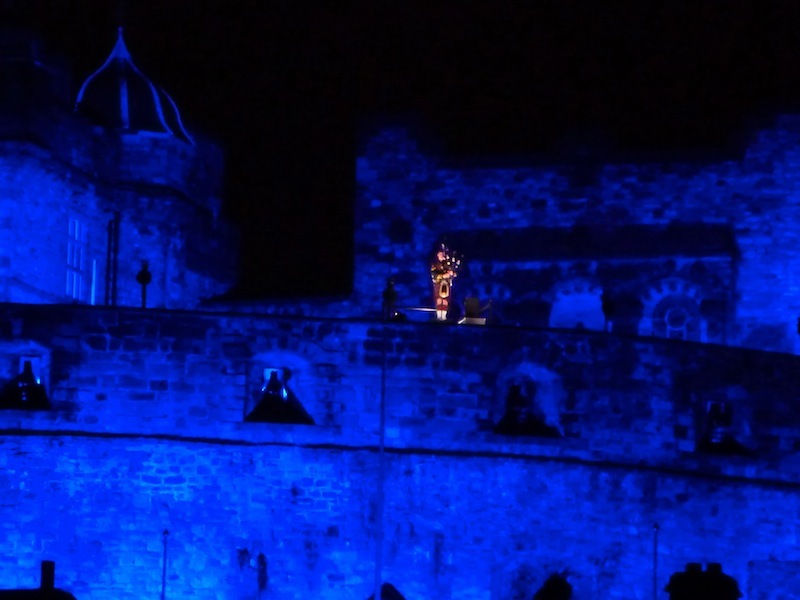 The Band from the Highland Regiments marching and playing their bagpipes and drums in close formation was excellent but… I will always have the memory of the lone bagpiper on the castle walls playing his haunting solo as the epitome of Scotland. 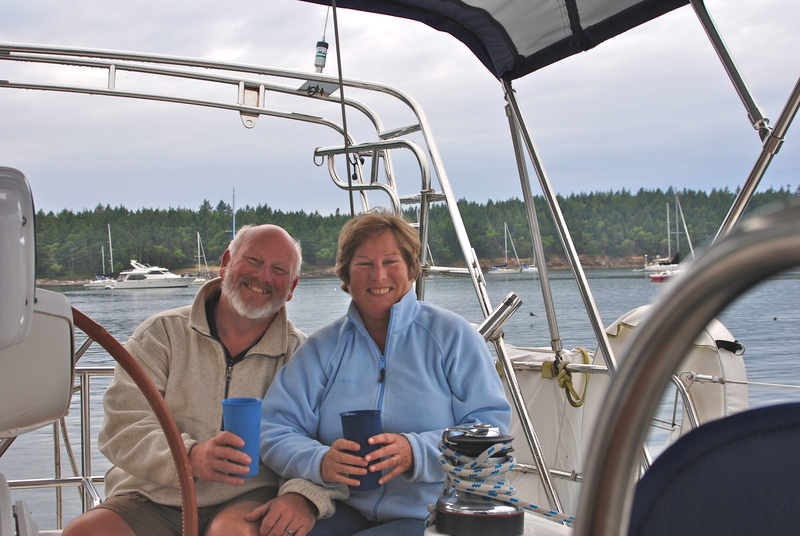 And from Sue….some lasting impressions. When I think of all the wonderful sights we saw in Scotland, one of the first that comes to mind are the intense colors. Purple heather, green grass, and white wooly sheep; colors as extreme as the changing weather, which went from sunny blue skies to misty gray clouds bringing slashing rain. “Look at that heather!” was one of my most used phrases…along with “stay to the left, stay to the left”. The 2014 Scotland Happy Dance Awards! 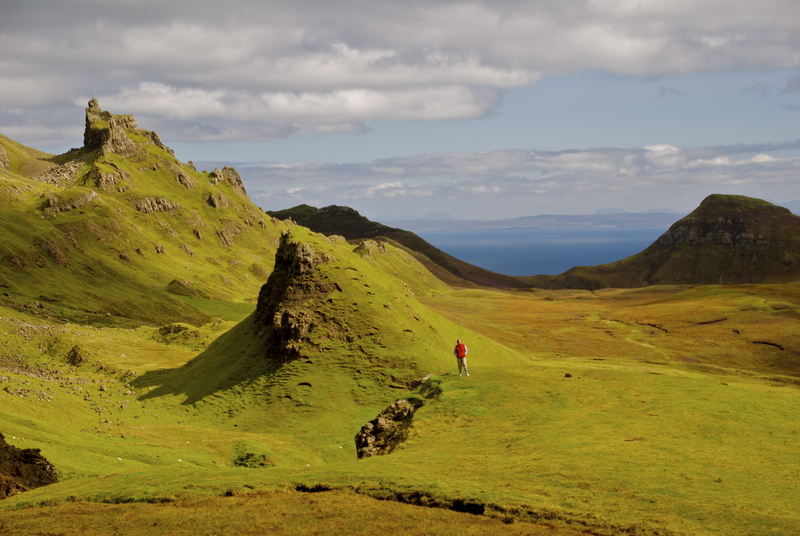 For best scenic beauty there are too many winners to list them all, but the Quiraing on the Isle of Skye is truly in a class by itself. The rugged rocky crags jutting up from steep slopes of heather, all situated high above the green moors and blue ocean is an incredible sight to see! For best ruins in a country full of amazingly well-preserved sites, Melrose Abbey with its towering walls, intricate details, and wide open views takes the prize. Urquhart Castle takes a close second, situated on the shore of Loch Ness. For best historic restoration, Stirling Castle is far and above any of the others that we saw. The depth of research, detail, and artistry used to recreate the King’s Palace, as it would have been when first completed is absolutely stunning. The King’s chair beneath the recreated tapestries. For the best and saddest moment of jolting reality; standing in a chilly breeze listening to a voice full of Scottish pride recreating in our vision the sight of the bloody Highland defeat while standing on Culloden field. For best breakfast in a land that prides itself on getting the day started with a full tummy, The Old Manse B&B takes the cake (wait a minute…we didn’t eat cake!!). And while we’re on the subject of food, the best scariest food was a tie between haggis and black pudding (you have google..look ‘em up!). Best sweet treat was without competition; sticky toffee pudding! For best goose bump moment, the sight and sound of the magnificent Highland Pipers marching in formation out of the gates of Edinburgh Castle onto the Military Tattoo field is a moment I’ll never forget. For best souvenir, flowered wellies! For best roadblocks: wee shaggy beasties win in a slight edge over the color-coded wooly sheepies! And for the overall best teary-eyed, goose bumpy, toe-tapping, pinch me moment, best of the best of Scotland 2014…it has to be the ceileigh. Sitting in a friendly pub enjoying a wee dram and watching as a group of local musicians started wandering in, pulling out violins, bodhram, pipes, and squeeze box, to join together for the love of their music and culture, and sharing it with all of us outsiders. There are so many bests of the best from our trip to Scotland that it would take many more pages to try to list them all. We had an amazing time, we loved every minute, and we definitely plan to return! * Scotland Independence Referendum update…the No’s seem to have won it by a NO’se…!